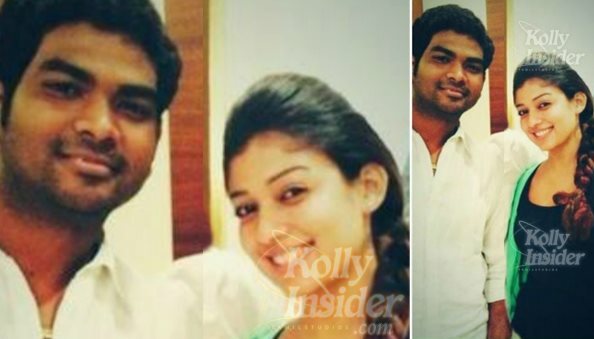 Vignesh Shivan - Nayanthara's new lover...? There is sensational news in Kollywood about Nayanthara’s new love and her lover. Home » Nayanthara | Vignesh » Vignesh Shivan - Nayanthara's new lover...? Nayanthara’s complex relationships with Simbu and Prabhudheva are well known in the industry. Her permanent tattoo of Prabhudheva’s name is still on her hand and she sheepishly hides it whenever shutterbugs focus their attention on her. The latest grapevine in the industry is that Nayanthara has developed a close bond with director Vignesh Shivan. Vignesh Sivan had directed the Simbhu starrer Poda Podi. Since this film did not do well at the box office, he never got any offers. After a tough struggle, he got the opportunity to direct the film Naanum Rowdythaan which has Vijay Sethupathi and Nayanthara in the lead role. It was Vignesh Sivan who had penned the lyrics for the song Adharu Adharu in the film Yennai Arindhaal. He penned lyrics for few other songs like "Engadi Porandha" in Vanakkam Chennai, "En Life In Angel" from Virattu and some musical videos for Anirudh. He has regularly associated in projects also involving Silambarasan, Dhanush and Anirudh Ravichander. He has also donned a small role in the Dhanush starrer Velai Illa Pattadhari. Sources say that he is Nayanthara’s new lover. “Nayanthara shares an extra-ordinary rapport with Vignesh on the sets. She recently gifted a car for his hard work in the film. Nayan also introduced Vignesh to her parents recently. Both of them are Malayalis too,” says a source close to the film’s unit. He had become very intimate with her while directing the film Naanum Rowdythaan. Recently both of them have been on a jolly trip to Maldives. Is there are chances for this love to materialize in to marriage. It seems that there are lots of chances for this marriage to happen. The reason is Vignesh is also a Malayalee like Nayanthara and also hails from Kerala. Maybe with this confidence she has taken Vignesh to her ancestral village in Kerala. Apart from introducing her family to Vignesh, she has also offer special masses at the local church. In view on the foregoing, sources close to her say that this love will end up in marriage. NEITHER HON. AJIT KUMAR OR HON. SHALINI is MALAYALEE, thus don't try to steal Tamil's pride: Here is the potential truth: Actor Full Name: Ajith Kumar / Mother tongue: Tamil /Family: Subramaniam-Father, Mohini-Mother, tow brothers and Shalini-Wife (Telungu /Tamil decent) / Titles: Lucky Star, Ultimate Star./ Height: 5′ 11″ / Brought up in: Chennai. TAMILS AND TAMIL NADU are very broad minded people and nation (WITHIN NATION): WE NOT ONLY HAVE OUR VERY OWN TALENTS (e.g. Right. Hon. Dr.Abdul Kalam, the brain contributor of the 1st Surface-surface Missle to India), BUT WE ALSO APPRECIATE, ACCOMMODATE & RECOGNIZE other state people who come in search of jobs in Tamil Nadu. Think about it how many other state actress and acotors working in Tamil Industry and earning their living (putting food on their table). WHICH IS WHY THE TAMILS / TAMIL NADU ARE THE MOST CIVILIZED / BROAD MINDED COMMUNITY.